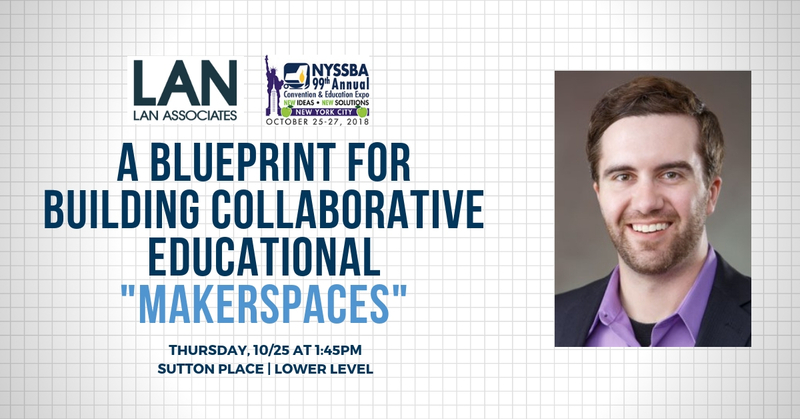 Matthew Fink, Associate and Architect of LAN Associates will be presenting at the New York State School Board Association (NYSSBA) 99th Annual Convention & Education Expo on Thursday, October 25 in New York City. The seminar entitled “A Blueprint for Building Collaborative Educational Makerspaces,” will facilitate discussions on the transformation of specialty classrooms. Our team can also be found on the conference floor, at booth #763. Details on the speaking session can be found below. Overview: Classrooms are no longer rigid, forward-facing spaces. Classrooms today are flexible and encourage students to collaborate and discover their own path. Hear the latest on learning environments, designs, and theories and how makerspaces can boost student performance and retention.